Finally, last weekend, finally, something splatted against the wall and stuck for NASCAR. The bad news for North America’s premier stock car racing series, however, continues to be the large pile of refuse that has slid down that wall and is laying there steaming and congealing. The final laps of Sunday’s race at the Charlotte “Roval” were highly interesting. Albeit interesting in a shocking kind of way as top driver after top driver chose to blow toe after toe off their own feet. If you like Jimmie Johnson even just a little bit, you had to be undergoing a WTF moment when he senselessly chose to attempt a bizarre pass of race leader Martin Truex Jr. on the final turn of the final lap at the CMS infield road course. The seven-time Cup champ was running second at the time and had he finished in that position, he would still be thinking about celebrating an unprecedented eighth championship next month in South Florida. It was all so un-Johnson-like. To that point in his career, he had paved his road to the Hall of Fame one careful brick at a time by quietly making good decisions. He and his Hendrick Motorsports team had been making on-track progress late in the season and with a little luck and, perhaps, some non-thinking mistakes by others, No. 8 for No. 48 just might have been in the offing. He just wanted to win, he said. He just wanted to end his painful futility streak at 52 races. As he explained it on camera after the race, it was all so reminiscent of stick-and-ball athletes attempting to defend non-defensible personal and athletic-field meltdowns by saying “I just want to win so badly”. Johnson, last Sunday, ended up thinking little picture. 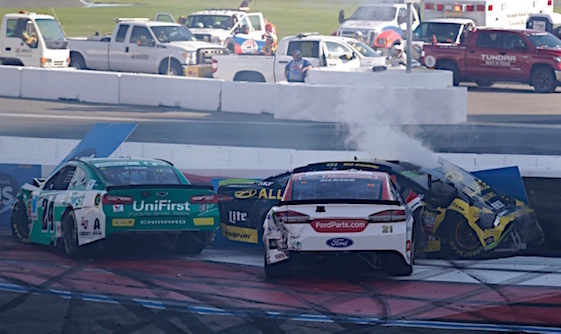 And how about Brad Keselowski, Kyle Busch – both former Cup champions – and Kyle Larson driving straight into a tire barrier on a restart while running at the front of the field late in the race? That incident had some reason behind it: old tires and a tight field behind them but champions and would-be champs driving like texting teens? Winner Ryan Blaney was good post-race too as he fumbled for a reaction to his taking advantage of the surprise circumstances of the Johnson-Truex say what? moment. Finally the sight of Larson muscling his demolished car around the track like a drunk trying to flee a post bar time street wreck was old-school beautiful. So yes, the first Roval race at CMS had its entertaining moments. The only complaint about a road course in the playoffs is that the road course should be a real road course. VIR, Barber or Road America come to mind. The problem for many fans continues to be the problem that has been growing and reproducing since Brian France and his band of beancounters took over the sport: the gimmickization of NASCAR. First and foremost, stage racing is garbage. No matter how constant and how loudly the sport and its media “partners” try to brand it as wonderful, exciting stuff, the view here is that it is garbage. It plucks simplicity and replaces it unnecessary complexity. It does not add drama to races and championship runs. It adds melodrama. And the last thing the sport’s fans need are those 10-minute, commercial-filled breaks between stages. This stage racing crap with its stage points and playoff points is insulting. It would be like the NFL giving final-score points for teams getting 20 or more first downs, or for time of possession or for most players over 300 pounds. The expectation here is that on Sunday in Dover, it will be back to the same old, same old.